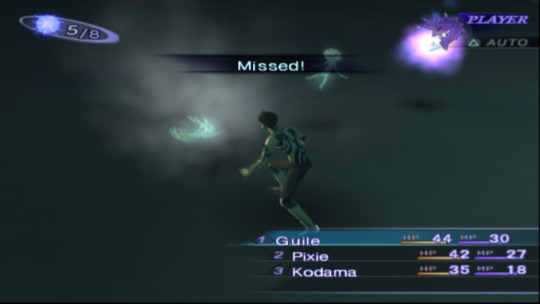 Shin Megami Tensei: Nocturne used a turn based battle system called the "Turn Press" system. I love this system but it is complicated so please bear with me a moment while I try to explain it. In a normal Turn Based RPG each character in your party gets a turn, then the enemy party gets to take their turns. In Nocturne though instead of each character getting a single turn what happens is that you get "Turn" points equal to the number of characters in your party with a normal action costing 1 Turn point. If nothing special happens then it is just 1 turn per character per round, same as the normal Turn Based RPG model, but in Nocturne something special always happens. If you land a critical hit or hit an enemy with an attack they have a special weakness to then instead of that attack consuming a whole Turn point it "charges" that Turn point which allows it to be used again. Basically, you get an extra turn for the party. For convenience sake I'm going to refer to both landing a critical hit and hitting an enemy in their weak point as a "crit" for the rest of this essay as their gameplay implications are the same for our purposes here. A regular attack will consume 1 Turn, a crit will charge the first uncharged Turn point you have left and if all Turn points have been charged then "good" attacks will also consume the Turn Points. The Turn Press system is easiest to explain by its effects. Hitting enemies in their weak points gets you bonus turns, maxing out at double the number of turns you started with. The better you do hitting the enemy in their weak points the more turns you get to hit them in their weak points, magnifying the effects of planning for an encounter and being prepared with a counter to the enemy. The problem is that is really complicated. I mean, my explanation of it has been going on for a while and I haven't even gotten to the part where I explain how missing an attack consumes 2 Turn points instead of 1, or what happens when you have a multi-strike move and some attacks hit, others miss, and another crits (answer: it consumes 2 Turn points). Or how the order of operations matters in terms of if you land a crit vs normal attacks. Or how each character can "Pass" on a turn which charges the first Turn point unless it is already charged then it consumes it per normal unlike with a crit. Or about the items or spells that effect it giving charged turns in exchange for full turns and so on. There is a lot to this system. I’d like to talk about how this system punishes missed attacks and how it incentivises the player to take fewer risks especially with attacks that hit multiple times or attack multiple enemies (because there are more chances for a miss and thus riskier), but I think this essay is long enough as is. Now, in motion, people tend to get a handle on this system pretty quick. It sounds -and is- really complicated but they do a good job of conveying on screen what is happening with the Turn points and so it isn't something players have to spend a great deal of time studying up on. It has fantastically interesting battle and team composition implications that rewards players who really dig into the mechanics of how this system works. But it is still just really complicated and all that complication is front loaded on the player because having a working understanding of this system is a requirement for any progression. Now, lets jump forward in the series a bit to Shin Megami Tensei: Persona 3. Persona 3 doesn't have the Turn Press battle system, it has a more standard/bland turn based system. Everyone gets their own turn every round. The series has left behind the Turn Press battle system, but if we look closely we can still see the gameplay patterns that defined the Turn Press system all over the place. In Persona 3 if a character gets a crit then they get to go again. They can keep doing this, landing crits and going again as many times per turn as they please but they only get an extra turn the first time they crit against each enemy. If you are fighting 5 enemies who are weak to fire you can hit each with their very own fire spell, but hitting them again will gain you nothing (other than the damage). Hitting an enemy with a crit inflicts them with a status called "Down", and you can't get an extra turn off a downed enemy. Downed enemies do take more damage though. This is basically what happens with the Turn Press system, except without all that overt complexity. Get in a good attack, go again, with a cap on how many times you can attack. One big difference between the 2 systems though is that in Persona 3 the character who earned an extra turn is always the one who uses it, that is not the case in Nocturne. In Nocturne there a set order in which teammates take their turns. If you get an extra turn the one who gets to take that turn will be the first in the order, and the second and so on. In Persona 3 each character earns their own extra turns while in Nocturne you earn extra an turn for the team. Fights in Persona 3 have a greater tendency to be taken over by a single character on your team who happens to have the spell all the enemies are weak against. They have a ice spell and all the enemies are weak to ice, so that character casts ice 5 times and the battle is over. In Nocturne this same situation would make that character the star of the fight but based on how they are positioned in the line up you might have to do some strategic turn passing in order to get them a chance to attack even twice per round. Each character gets the chance to shine even brighter in Persona 3 but they also can't share the spotlight the way you can in Nocturne. 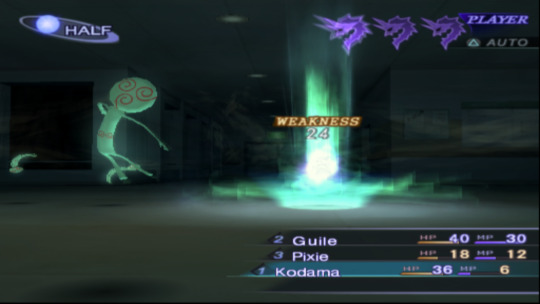 In Nocturne you can earn another character an extra turn so that they can cast a heal spell. Or you can pass your turn to a teammate so that they can be the one to attack. The basic pattern is there, but a lot of the complex team dynamics that come from it are gone. 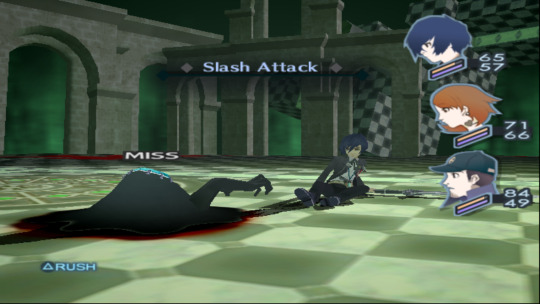 To help bring the focus back towards the team Persona 3 introduces team attacks, where if all enemies are down (have been hit with a crit) then you can attack all the enemies as a group for a lot of damage. Persona 3 doesn't want to be a game about strong individuals but a game about a team. 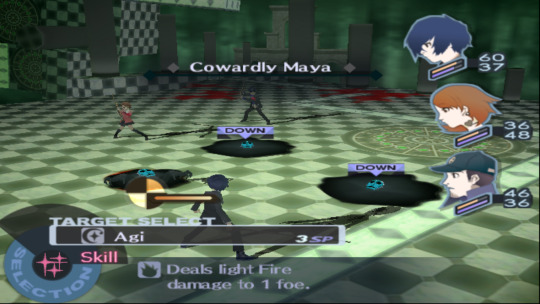 The battle mechanics in Persona 3 often mimic specific effects of the Turn Battle system while trying to avoid the outright weird complexity of it. But the game isn’t just attempting to simplify the mechanics of the Turn Press battle system because the game adds in a whole host of its own complexities and twists to battle that were never present in Nocturne. In many ways adding in new complexities to the game was only possible because it removed the Turn Press battle system which, while interesting, was so hugely costly in terms of burdensome complexity that it crowded out the chance to add in different sources of complexity. Another way Persona 3 mimics the Turn Press system is if a character misses a melee attack in Persona 3 then they get the down status which takes another turn to recover. This mimics the fact that a missed attack in the Turn Press System took up 2 turns. In the re-release Persona 3 Portable getting up from "Down" doesn't take an extra turn. I'll miss the Turn Press system. It was weird, complex, and interesting. But I won't miss it too much because while it is officially gone many of the gameplay implications that helped make it so interesting continue to live on in the Shin Megami Tensei games. It hasn’t died, rather evolved. It shed a lot of the overt and up front complexity that might turn people away while keeping much of what made it great, and where we miss out on some interesting interactions and depth we can add some back in with other mechanics. It continues to evolve. Persona 3 is just the one I touched on here but the system and reward patterns that defined the Turn Press battle system keep growing and changing in the Shin Megami Tensei series. You can read more of my essay here.